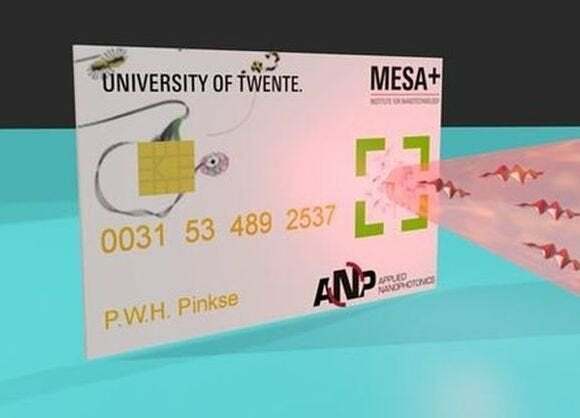 The researchers at the University of Twente and Eindhoven University of Technology coated a credit card with a thin layer of white paint containing millions of nanoparticles. When light hits the nanoparticles, it bounces around until it escapes, creating a unique pattern that depends on the precise position of the particles in the paint. The card is “enrolled” in the system by recording the way that it reflects light. To authenticate the card, a bank machine showers the paint with a pulse of light that is unique to each transaction. When the correct tell-tale pattern of light emerges as an “answer” to the bank’s “question,” the card can be authenticated. The approach uses simple, relatively cheap and readily available technology such as lasers and projectors. Pinkse said that if mass-produced, a readout device wouldn’t cost more than a projector phone at about $1,000 since it has the necessary components.